This is about 1/2 of the backyard in view here. You can also see our backyard on our weather webcam here. For some reason the homeowner removed every...single...tree...and...shrub from his lawn. On Google maps you could see an area of pine trees in the middle of the backyard, but no longer. More for me to mow. I'd been wanting to do this for months, and it wasn't till just before Labor Day that I finally did it! I measured the distance covered mowing our big backyard. I also measured the time and the calories expended doing it. Remember, I'm a numbers girl! It wasn't hard -- I guess anyone could do it with a pedometer, right? But of course I had to get all techie! We have an enormous lawn, and because we won't be living here that long, we chose not to invest in a riding mower, and just tough out using our 11-year-old 21" wide push-mower. When we first moved here in the cooler season, this wasn't so bad. I didn't have to mow at all for the first 3 months, and then it wasn't often. Note: Many of you know that I'm the one who mows the lawn in the family. I don't mind at all. Until we moved into this particular house, doing this chore wasn't a big deal. In fact, if I mow on weekends, it's a nice break from the kids! Dave has horrible grass allergies, and I'd rather take on this chore than deal with his nose-blowing after he does it. But by Memorial Day, in order to mulch the grass I was cutting (I can't stand bagging/dumping grass), I had to mow no more than weekly, preferably every 5 days to minimize clumps of dead grass among the mulching. It got really old really fast. I need about 2 hours to do the entire lawn, but not while the sprinklers are running, or first thing in the morning when the lawn is covered with dew. So I'd usually wait until as late in the evening as possible, and mow mow mow until I couldn't walk in a straight line anymore because it was so hot. And I'd still be soaked in sweat. Between the sweating, sore arms and all the walking I was doing, I figured I'd regard this as a real workout. Ignore the fact this is being called a "run". Obviously it isn't, as seen by the 22:23/mile pace. This is the front yard only. It's about 1/2 the size of the back. 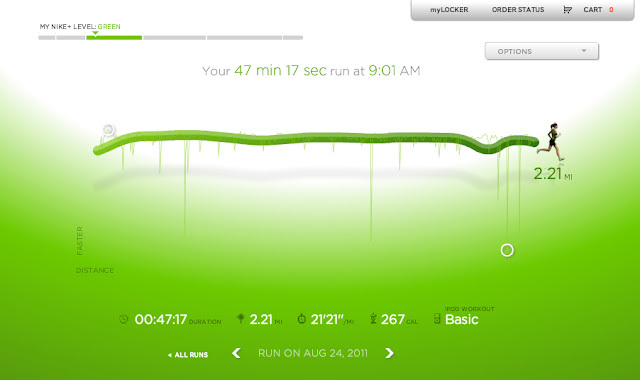 The thin line is a micro-measurement of my pace, and it makes me wonder if there's a slope to our yard. I was mowing in rows parallel to the front of the house. The deep plunges in the pace graphs are water breaks. This past spring, Wired.com posted this How-to Wiki with ideas on how to make the dreaded lawn-mowing chore more tolerable. From getting rid of grass in favor of flowers, trees and shrubs...to robotic lawn mowers (i.e. Roombas for your yard!). I would have NEVER thought about cutting the grass would require that much walking. I would have guessed even a 'big' yard would have only been a mile or so. YIPKES! My feet are sore just thinking about those 4 hour yards I used to cut as a teenager in my lawn cutting days for pocket money. Baking in that hot Alabama sun and getting about $2 an hour. The Nano has a pedometer that does not use the shoe sensor. There is an accelerometer build in the 6th gen Nano. 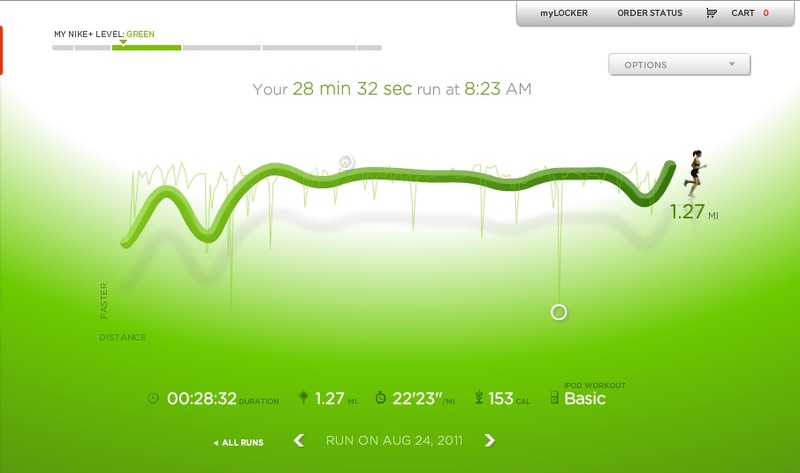 The Nike App on the Nano also has a 'Walking' selection on the same screen as running. I'll have to check that out next time I fire up the chipper. I often wear the chest strap and monitor my heart rate when I do physical work. And I do 'count' that as my workout if I get my heart rate into the target zone long enough. Thanks for the idea. I'll use it soon I'm sure! Yes, geeky - but very cool!!! My Cub Scouts -- All Three of Them!